In her first half-hour talk, Harriet Friedmann looks at food system transformation from the perspective of food regimes. She developed this perspective with Philip McMichael at Cornell University. They drew on French historiography, which looks at long time lines (long duree), and on US work on World System Theory, especially as exemplified in the work of Giovanni Arrighi, author of The Long Twentieth Century: Money, Power, and the Origins of Our Times, in looking at how the state system and world economy developed through long cycles since its origin 500 years ago, through colonial empires and international trade. Relations among states in each cycle form a unique state system which organises that global market. This system of states goes through important transitions, in which the dominant states in power change and power alignments shift. The other important influence on this work on regimes is the French idea of filieres – long chains – from farm to table and the systems of transformation – processing, distribution, storage. Food regime analysis follows these material chains to track state power, capital investment, class formation, and regional specialization constituting historical agro-economic systems. In this talk, Harriet first defines food regimes and their transitions, then discusses them since since the mid 19th century, and the current contradictions that may lead to a new regime. Settler colonial food regime develops: 2' 19" - 8' 27"
Interrupted by war, ended by economic collapse: 8' 27" - 13' 25"
The mercantile-industrial food regime, 1947-73: 13' 25" - 22' 16"
Into crisis in 1973, and still there? : 22' 16" - 26' 09"
Discovery: Production is not enough for health or sustainability: 26' 09" - 30' 00"
Friedmann, Harriet, “From Colonialism to Green Capitalism: Social Movements and the Emergence of Food Regimes,”in Frederick H. Buttel and Philip D. McMichael, eds. New Directions in the Sociology of International Development. Research in Rural Sociology and Development, 11. Amsterdam:Elsevier, 2005, pp.227-64. Friedmann, Harriet, “What on Earth is the Modern World-System? Foodgetting and Territory in the Modern Era and Beyond,” Journal of World-Systems Research (online). Vol. VI. Summer/Fall 2000. Special double issue edited by Giovanni Arrighi and Walter L. Goldfrank, in honour of Immanuel Wallerstein. Friedmann, Harriet, “International Political Economy of Food: A Global Crisis,” New Left Review no. 197, Jan./Feb. 1993, pp. 29-57. Friedmann, Harriet and Philip McMichael, “Agriculture and the State System: The Rise and Decline of National Agriculture,” in Sociologia Ruralis XIX (2), 1989: 93‑117. McMichael, Philip, Food Regimes and the Agrarian Question. Halifax: Fernview, 2013. McMichael, Philip. Development and Social Change: A Global Analysis (5th ed.). Thousand Oaks: Sage, 2012. Worster, Donald. Dust Bowl : the southern plains in the 1930s, New York : Oxford University Press, 2004 . Cronon, William, Nature’s Metropolis: Chicago and the Great West. NY: W.W.Norton, 1991. Bayliss-Smith, Tim, The Ecology of Agricultural Systems. Cambridge University Press, 1982. Berry, Wendell, The Unsettling of America: culture and agriculture. San Francisco : Sierra Club Books, 1977. Montgomery, David. Dirt: The Erosion of Civilizations. University of California Press, 2007. Weis, Tony, The Ecological Hoofprint: The Global Burden of Industrial Livestock. Zed, 2013. Weis, Tony, The Global Food Economy: The Battle for the Future of Farming. Zed, 2007. Wood, Robert. From Marshall Plan to Debt Crisis: foreign aid and development choices in the world economy, Berkeley : University of California Press, 1986. Marsden, Terry, Andrew Flynn and Michelle Harrison. Consuming Interests: the social provision of foods. NY: Routledge, 2000. Winders, Bill, The Politics of Food Supply: U.S. Agricultural Policy in the World Economy. New Haven CT: Yale University Press, 2009. 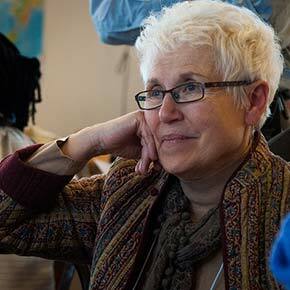 Harriet Friedmann, food systems analyst, author, and speaker, is Professor Emerita of Sociology, Geography and Planning at the University of Toronto, based at the Munk School of Global Studies. She participates in international research and policy on food and agriculture, including with Centre International en Recherche Agronomique pour le Developpement (CIRAD), the International Assessment of Agricultural Knowledge, Science, and Technology for Development (IAASTD) and serves on several editorial boards of journals related to food and agriculture. She is a member and former chair of the Toronto Food Policy Council, a pioneer in linking civil society and municipal governments in comprehensive food strategy. She has published on many dimensions of agriculture and food, including family farms, corporate strategies in the food sector, food policies, changing patterns of diet and consumption, and social movements to change the food system, focusing on trans-scalar dynamics. Harriet is currently preparing a book on the Political Ecology of Food with Tony Weis. She was awarded the 2011 Lifetime Achievement award by the Canadian Association of Food Studies. If you want to arrange for follow-up discussions for a class with Harriet Freidmann via the internet – over Skype or some other service - please contact her.